CONGRESS | 17TH DISTRICT | A Sacramento Superior Court judge ordered the removal Wednesday of one of the three Republican candidates in the 17th Congressional District race from the June 3 primary ballot after invalidating two nominating signatures. Vinesh Singh Rathore, an attorney for Google, offered only the minimum number of 40 nominating signatures to the Alameda County and Santa Clara registrar of voters earlier this month. According the The Recorder, a Sacramento-based legal publication, Judge Allen Sumner threw out two signatures deemed to have been written by the same hand. A lawsuit filed Monday by Jeffrey Wald, a long-time Alameda County Republican Party insider had alleged Rathore’s nominating papers were invalid. The suit also alleged the nominating papers of Joel VanLandingham, yet another Republican in the race, contained signatures also included on Khanna’s petition. The judge, however, found no state election laws forbidding “cross-candidate support” and allowed VanLandingham’s name to be included on the ballot. The ruling comes just one day before the California Secretary of State is due to publish the list of certified names for the June primary. Subsequently, the sudden reconfiguring of the race may reverberate through the next two months of the primary season. The absence of Rathore, and Indian American who only recently became a Republican, may force some recalculation in the race, which also features a Republican Indian American woman named Vanila Singh. Khanna, though a Democrat, is also of Indian ancestry in a congressional district with a large South Asian population. Some observers had openly questioned whether Rathore’s candidacy was legitimately inspired or raised solely as a bulwark against Vanila Singh’s potential to siphon moderate and conservative votes away from Khanna. In fact, at the Republican state convention in Burlingame two weeks ago, there was significant grumbling and speculation over the sudden appearance of Rathore in the race. Monday’s lawsuit was filed by the San Francisco law firm headed by Harmeet Dhillon, the vice-chair of the state Republican Party. Wald’s suit, though, more than insinuates Rathore candidacy came at the behest of Khanna. However, only anecdotal evidence is offered. For instance, the lawsuit alleges the use of Singh, Rathore’s middle name, on nominating papers appears nowhere else in the public sphere and constituted a strategy to confuse voters with Vanila Singh. It also notes Rathore switched his party affiliation to Republican just a day before filing three weeks ago. “The addition of Singh Rathore and VanLandingham, both of whom are running as Republicans, will split the GOP vote, effectively moving Khanna to second place in the top two June 3 Primary Election,” said the suit. Khanna, Rathore and VanLandingham have all denied the allegations, according to media reports. Polling last month paid for by Democracy for America, a Honda supporter, raised questions whether Singh’s entrance into the race might erode Khanna’s chances of winning one of two spots on the November ballot. Posted in Alameda Republican Party, CA17, congress, Harmeet Dhillon, Jeff Wald, June primary, Mike Honda, nominating signatures, Republicans, Ro Khanna, sacramento, Vanila Singh, Vinesh Singh Rathore. Bookmark the permalink. Wonder how much Khanna's folks spent in this effort? 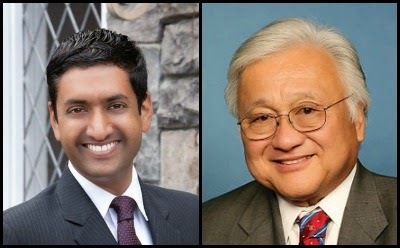 Manipulation by Ro Khanna, local Democrat party, who knows? Rathore is a faux candidate whose entrance was planned to disrupt the race. Good riddance. A smart move carried out in the most foolish manner. How can a guy, Vinesh Singh Rathore, an attorney for Google, offer only the minimum number of 40 nominating signatures? What, even if all were legit, you have to figure on getting 5 or 10 extras just to be safe from normal problems. The if there really were one or two in the same handwriting, how can you be so dumb to allow it to appear as such. All in all, amateur hour. Some guys, smart enough to be a lawyer, yet so stupid in the basics. Oh well, I still don't anticipate any direct tie to be found to Khanna, even it was instigated by his people. Silly episode carried out by fools. You need 40 signatures, and you only get 40…. Like driving a car to a destination 40 miles away in a car that gets 40 mpg and relying on 1.00001 gallons of gas. It's scary that your the only one to report this news–both the Mercury and Chron are silent on this decision by the judge to throw someone out of a congress race, whether or not RK was involved. Sad couple of days for our system with the Yee incident, and now silence on part of msm on judge catching in time a borderline act by a would-be pol. So much for a two or 3 party system in CA, and California voting and election laws. Redistricting was a farce, and now dirty rotten politics has invaded the election process. Military ballots not even counted, what a sham our elections have become! What about all the ballots found in the SF Bay on election eve in San Mateo County a few elections ago, no arrests made or even an investigation. Recall Honda!